The Province of Como (Italian: Provincia di Como; German: Provinz Como; Comasco: pruincia de Comm) is a province in the north of the Lombardy region of Italy and borders the Swiss cantons of Ticino and Grigioni to the North, the Italian provinces of Sondrio and Lecco to the East, the Province of Monza and Brianza to the south and the Province of Varese to the West. The city of Como is its capital — other large towns, with more than 10,000 inhabitants, include Cantù, Erba, Mariano Comense and Olgiate Comasco. Campione d'Italia also belongs to the province and is enclaved in the Swiss canton of Ticino. 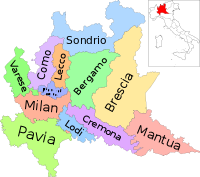 The Bergamo Alps and some hills cover the territory of the province, and the most important body of water is the glacial Lake Como. This page was last edited on 16 January 2019, at 14:27 (UTC).